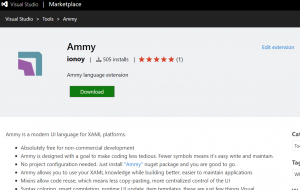 Go to Visual Studio Marketplace and download Ammy. Close Visual Studio if it was opened and install downloaded extension. We will create a user control that will be a host for all of our UI inside the main window. Ammy Extension should have added few item templates, namely: Ammy Application, Ammy Mixins, Ammy User Control and Ammy Window. Just choose Ammy User Control, give it appropriate name, for example Host.ammy and click Add. 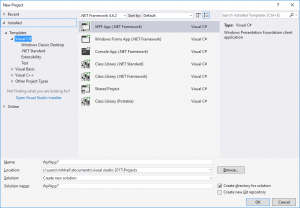 Visual Studio should open your newly created file now. Add this to Window tag. Just replace WpfApplication1 with your local namespace. Now you can build solution and run it. Windows Firewall may ask you to Allow access first time you launch application. We use sockets to send UI updates to the application when you edit Ammy files in Visual Studio. Update code is only generated in Debug build, so when you compile in Release, no network sockets will be created. If you want to turn UI update in Debug build, you can use NO_AMMY_UPDATE conditional compilation symbol. You should see an empty window with “Hello, World!” in the left corner. Switch back to Visual Studio without closing the application and change text to “Hello from Ammy”. Save file and watch as text in your application is updated to the new one. You can now add new user controls or windows to further develop your application. But what if you wanted MainWindow to also be Ammy file? Go to App.xaml and change StartupUri="MainWindow.xaml" to StartupUri="MainWindow.g.xaml"
Defining App with Ammy gives you the opportunity to create global XAML styles in App.ammy and update them in runtime to immediately see changes. Now go to the Documentation and learn all the cool things you can do!